Planning a family holiday, especially if you’re travelling with younger kids, can be very stressful. There are so many factors that you have to consider – transit times, food preferences, activities and sightseeing options… that it can seem pretty overwhelming. Especially while planning a family vacation in India, which is such a large, diverse country. While our country is definitely wonderful to travel through, we’re the first to acknowledge that it can be intimidating and oftentimes difficult. In fact, the very things that make India such an intriguing option for some travellers – her vivaciousness, the surprises she throws up – can make it seem like it’s not the best option for a family getaway. But India actually has so much to offer to families! You can read more about some of our favourite family holiday destinations in this article for some ideas on what families can do here. And, to make the rest of it easier, we’ve put together this guide on some things to consider while planning a family vacation in India. Picking the right hotels can make or break a family vacation. In India, you’ll find that some destinations have more of a range to pick from than others, but most places that attract tourists will have stay options that work well for children. Depending on how old your children are, homestays can be a great choice, especially if the host family also lives on site or close by. It’ll give your young ones a chance to interact with local children and make new friends to play with, which can make the experience a whole lot more relaxing and enjoyable for all of you! If you’re travelling with really young kids, you also might need access to a kitchen – and that’s another way in which homestays work well. Most hosts are very accommodating and will be happy to help you take care of the little ones needs! And, they’ll also be full of suggestions of what you can do with the kids to make sure that the holiday doesn’t get boring or full of adult experiences. And, of course, you will find many family-friendly resorts and hotels in big cities and destinations like Rajasthan, Kerala and Goa. These hotels often have entertainment areas for children, and some even offer babysitting services if you need a bit of a break. Children can be extremely fussy about food, and the new smells and flavours might make them reluctant to try anything. A good way to get around this is to try and introduce them to some Indian foods if you have access to any in your home country before you travel. However, you’ll also find international staples is almost all cities and towns across India so you don’t have to panic that you’ll be stuck without options if your child doesn’t take to Indian food. Additionally, because there’s such a large variety of flavours in Indian food, you’ll surely come across something that they’ll enjoy eating as well. Milder flavoured dishes like South Indian idlis and dosas are a great choice for those that aren’t familiar with too much spice, and are easily available in most parts of the country. And, of course, if you’re staying at a homestay, you could make special requests and they’d be happy to help out. Another concern is also making sure that none of you fall sick from the new foods that you’re going to be trying here. We’ve got a blog on avoiding Delhi Belly that you can check out for some tips and tricks. Some basic things to keep in mind include being careful of the water that you drink, and eating only hot food that’s prepared fresh. Having said that, it’s also important to remember to stay hydrated, as being out and about and sightseeing can drain you faster than you think, especially in a new environment! This is one of the biggest things to consider while charting out your family vacation in India. Distances in this country are large, and getting from one place to the other can be cumbersome, especially if you’ve got kids with you. And some regions, like Rajasthan, will often involve long road journeys between stops, and others, like the mountainous regions up north, will mean spending time on winding roads. You can plan your route carefully to make sure that you aren’t going to be spending more time in transit than you and your children will be able to handle, as being on the road for extended periods can get boring. A good alternative is to mix in train journeys with the drives – this is also a fantastic way to meet other travellers, both Indian and international! We can help you plan both your chauffer-driven trips and train journeys across India. Let us know what you’re looking for! As tempting as it is to do as much as you can while you’re on holiday, packing too much into the schedule isn’t a great idea when you’re toting tots about. Try and keep things slower paced, and include at least one thing a day that will be of interest to your children. And that doesn’t mean that you won’t be having fun, either. Forts can be exciting for kids to play explorers in, for example, and wildlife experiences are always a big hit. And, of course, you can spend some time on the beach as well – who doesn’t love the sea? 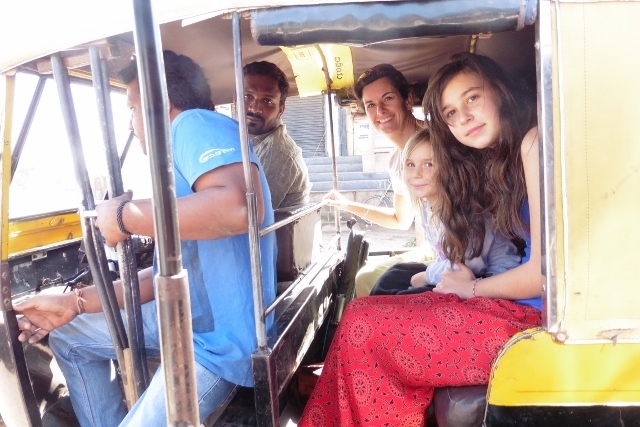 Like we said, putting together a family vacation in India can seem daunting. We’re here to help though, and we’ve got plenty of ideas for great family getaways. Get in touch and we’ll help you plan the perfect vacation in India for you and your family!